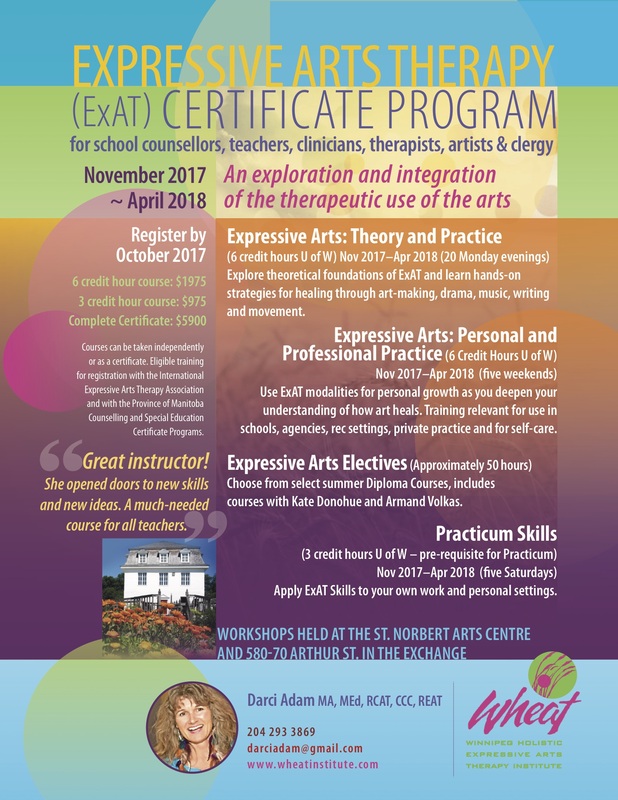 These professional development courses are valuable to anyone wishing to integrate the arts into their personal or professional practice, including school counsellors, therapists, healers, coaches, educators, resource teachers, elders, clergy and artists. You may register for single courses! Open to American and international students. Register before May 31, 2019 to prioritze your registration for the summer. Select Certificate and Diploma courses are open for drop-in registration - look for the (PD Drop-In Option) designation beside these class names. Click on "Program Fee Information" below for individual course fees. Please note class dates are subject to change. Poetry is a vibrant and powerful expressive language, practiced in cultures around the globe from ancient times to the present. Poetry draws on multiple levels of experience, desire and inspiration, and engages us on many levels at once, from the sensory and the emotional to the visionary. In this three-day workshop, we will explore formal and expressive elements of poetic creation inspired by witty, stylish examples of the contemporary long poem as it is practiced in Canada at present. Our name for this unique genre is the "multi-genre, multimedia disjunctive poetic narrative dream text." The form typically employs short fragments of lyric, data and word play, interspersed with visual images, gathered together to make a longer sequence. Movement in Expressive Arts Therapy will provide students with an introductory sampling of theory and movement applications, stemming from Western and Eastern influences, intended for personal practice, and workplace. Movement in Expressive Arts Therapy will introduce students to Yoga, Contemplative Movement, Contemporary Dance Improvisation, Trance Dance, Butoh, and 5 Rhythms. Movement in Expressive Arts Therapy will provide students with challenging, restorative, and creative movement experiences. This is a studio class; mostly lessons will be physical explored. Being Butoh Body will provide students with a variety of experiential dynamics, intended to develop movement potential, and body-mind consciousness. Being Butoh Body will largely draw from contemporary Japanese dance techniques that utilize core-work, stamina, mindfulness, ecology, and internal imagery. Being Butoh Body will provide students with an innovative, challenging, and inspiring dance experiences. This is a studio class, and will be in a warm-up, exercise, and sweat format. This course is designed to engage students with a process-oriented, body knowledge approach to experiential transformation. Through movement exploration, students will gain foundational tools to experience and facilitate body-mind expression. To succeed in this course, students will bravely explore, and share embodied material with rigor and curiosity, and include written articulations to foster personal growth, self-discipline and collective spirit. This workshop pulls from Dohee Lee’s training and practice in Korean Shamanism and performative ritual by utilizing techniques that connect to voice, body, heartbeat and spirit. How we tune our bodies through sound, movement and rhythm, guides us to navigate and delve deeper into our individual and collective roots, cultural heritages, natural environments and social consciousness. Throughout history and the world, there has always been a close connection between clowns and healers. Although this connection has existed in such diverse environments as Ancient Greece, First Nations cultures of North America, and courts of Medieval Europe; therapeutic clowning as a specific profession did not originate until 1986 when two separate programs began in Winnipeg and New York City. This course introduces the student to the art of clown in general and to therapeutic clowning specifically. The course will be primarily in workshop format; supplemented with some lecture, reading and video media. Students will engage in basic “clown play”, and begin to explore the relationship between clown, the pleasure of play, and sharing this pleasure with one's audience. Videos will be used to introduce students a variety clown styles and approaches. This workshop will introduce participants to the experience of trauma and how to address it as an expressive arts therapist. This workshop will also introduce the traditional definition and theory of trauma, brain research in relationship to trauma, the stages of trauma and indigenous healing practices that address trauma, i.e. expressive arts therapy .In addition, you will explore the Jungian understanding of trauma and how it interlaces with expressive. The workshop will include an intuitive and didactic understanding of these aspects through readings, arts and written assignments and multi-arts processes. This course introduces participants to the archetypal and developmental approaches to character/personality development using mythological themes that underline human development and the complexes that create the psychopathology framework. The hope is to enliven this exploration by utilizing an innovative Jungian expressive arts framework to explore the traditional framework. Participants will also be introduced to art as healing from an indigenous perspective including discussion of traditional symbolic cross-cultural healing practices and concepts of healing and wellness; the origins of the arts as a diagnostic tool from traditional perspectives, complexes as a healing function and the use of multi-arts processes to address the healing of developmental, traumatic and cultural wounding. forms of Indigenous people of Manitoba. In addition, explore how art can assist in the reconciliation process as a tool for healing, self-understanding and dialogue. This workshop is approved by the Manitoba College of Social Workers. Students will practice and explore how to use Focused Centered Art Therapy with different populations and groups. We will practice self-focusing, focusing with clients and focusing with groups. Focusing is a way of listening to the wisdom of the body, working with the felt sense, and increasing presence. Art Therapy facilitates our ability to be in the creative realm and access healing imagery and wisdom. Combining these two therapies allows us to befriend our inner experience, express it and move forward into change. Focused Centered Art Therapy implies using our creative process that involves colours, textures, shapes and lines to listen to, hold space for, and deepen self-awareness. It is original, imaginative and spontaneous. Through engaging with creative, free expression coming from the felt sense, we listen to and have a conversation with our body. Drama therapy uses acting improvisation and psychodrama as therapeutic tools. It is playful yet insightful and promotes spontaneity, creativity and expressiveness. Principles of Drama Therapy workshop will provide participants with an experience of being in a drama therapy group. A variety of drama therapy techniques will be utilized, including improvisation, acting techniques, psychodrama, sociodrama, Developmental Transformation (DvT), Playback Theatre and creative ritual. Principles of Drama Therapy fulfill the requirement for The North American Association for the Drama Therapy Alternate Training Program. This course fulfills the Principles of Drama Therapy requirement for those interested in becoming a Registered Drama Therapist (RDT).